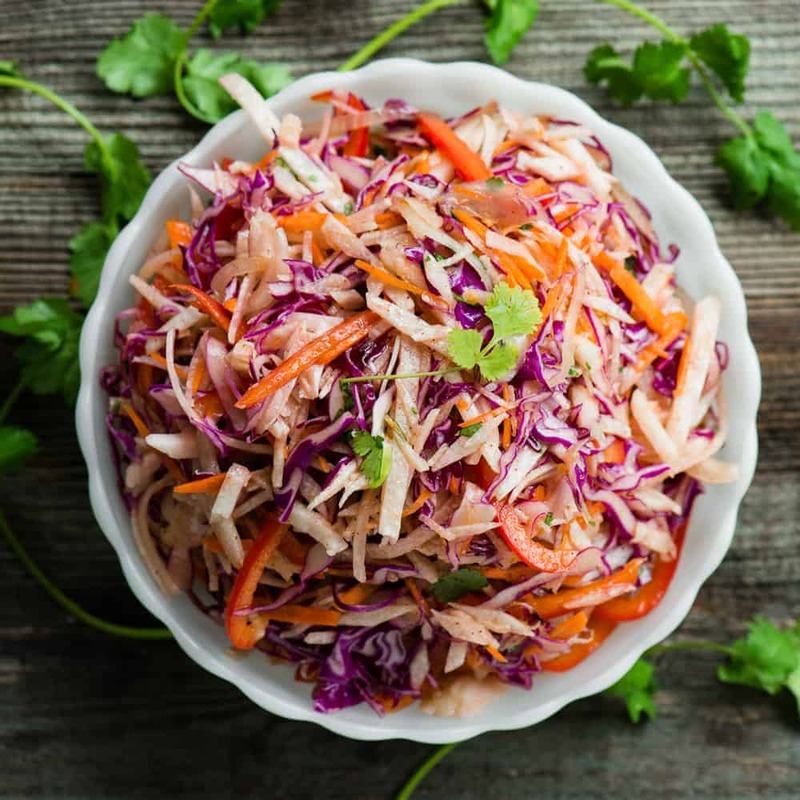 Jicama Slaw is a crunchy, fresh, light, and satisfying healthy vegan salad loaded with shredded veggies and tossed in a light and tangy vinaigrette. 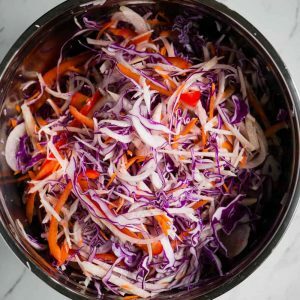 Whether you absolutely love jicama or have no idea what it even tastes like, I’m confident you’ll love this colorful Jicama Slaw! This post may contain affiliate links. That means that I will earn a teeny tiny (seriously, it’s ridiculously small) commission on anything that you buy, at no added cost to you. 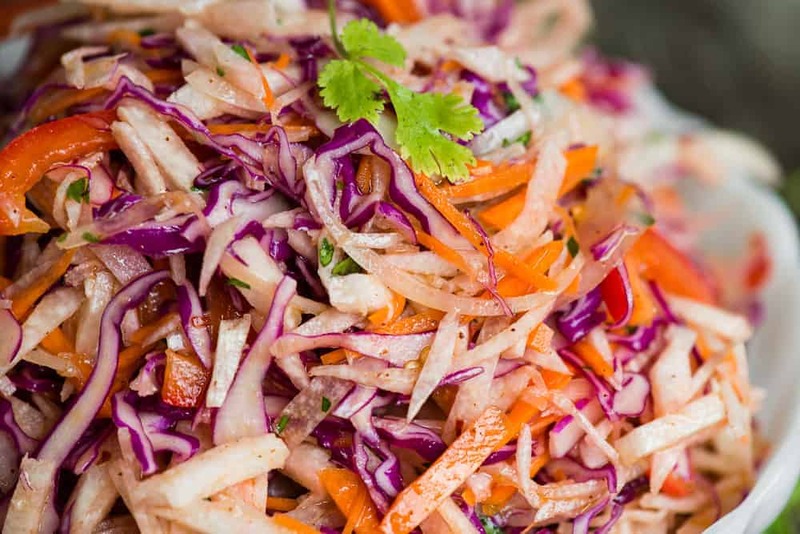 By supporting me this Jicama Slaw is a crunchy, fresh, light, and satisfying healthy vegan salad loaded with shredded veggies and tossed in a light and tangy vinaigrette. Do you eat jicama? I would love to know. Jicama is not something I grew up eating, thus it was never carried forward into my adult life. The first time I tried jicama I was well into my 30s. I was volunteering at my daughter’s preschool. Every Easter they would lay out rolls of paper and cover them with all kinds of raw vegetables and have their annual “Bunny Brunch”. At first it blew my mind to see a bunch of 2 and 3 year-olds eating bell pepper, zucchini and jicama. Kids that age are notorious for eating a diet that’s 100% Gold Fish and mac and cheese. But I surprised myself as well by eating that jicama. And you know what? It was GOOD! Jicama is a tuber vegetable. It’s actually part of the bean family, but the part we eat is part of the root that’s underground. The jicama we buy in the store is similar to a turnip. Weird, right? The outside of the jicama is yellow and a bit thick skinned. It wasn’t as easy to peel as a carrot or a beet. The white flesh on the inside is very similar in texture to a raw potato or an apple. Absolutely. In fact, I’ve never enjoyed jicama any other way. The flavor is sweet and starchy. The texture is crisp, juicy, and crunchy. It really did taste like an apple with a much more mellow and neutral flavor. 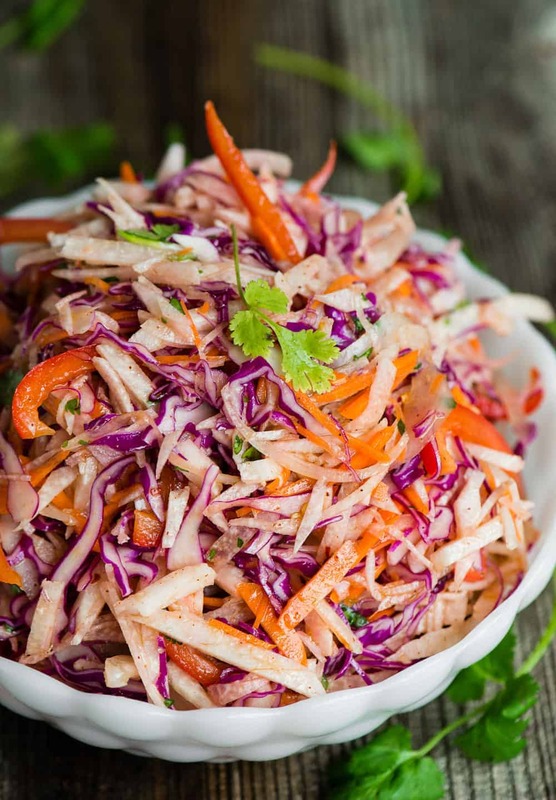 It was the perfect addition to this slaw. 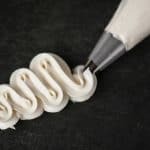 Is jicama a low carb vegetable? Jicama is actually high in carbohydrates. 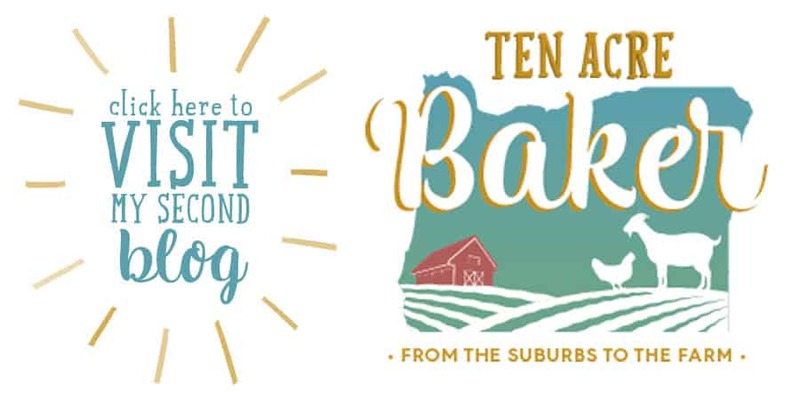 But they are the good carbs in the form of dietary fiber. 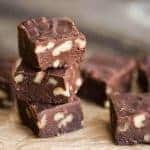 Different than, let’s say, a brownie. If you’re on a very restrictive keto or low carb diet, you might want to avoid jicama much like you would carrots or sugar snap peas. If you’re diet is not that restrictive, jicama is just another tasty and healthy vegetable that is good for you. There are only two main steps in this easy healthy salad recipe: cut the vegetables and make the dressing. To cut the vegetables, I love to use a mandoline. It not only slices things like the cabbage and onion super thin, but it cuts my jicama and carrots into match sticks. I did, however, slice the red bell pepper with a knife. The vinaigrette has a lot of different ingredients, but together they add a complex and tangy taste to this already interesting salad. Simply toss the dressing with the vegetables and you’re ready to serve. 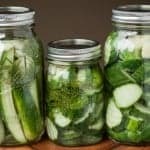 This salad also keeps well in the refrigerator for a few days. Place jicama slaw vegetables in a large bowl. Pour the dressing over the jicama slaw mixture and toss to coat well. Let sit at room temperature for 15 minutes before serving. Fascinating! I never even heard of jicama, but your description of it has me impatient to try it!! 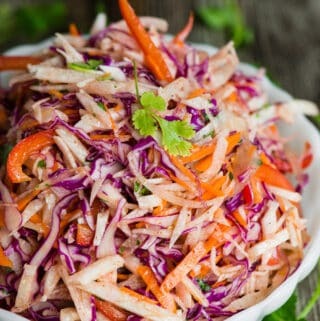 Love the flavors in your slaw too! looks like a very exciting recipe. Love Jaicama !! Your pictures are amazing. Can see tge crispy crunch of it. Flavor combination sounds very tantalizing. Can’t wait to make it. I love love love homemade slaws, and this one looks absolutely delicious! Looking forward to trying it! Jicama is one of my favorite ingredients and I really like the idea of this dressing. This is definitely my kind of slaw! jicama is awesome! I had kinda forgotten about it until reading this. 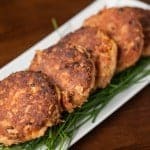 What a great recipe!! so fresh and delicious! 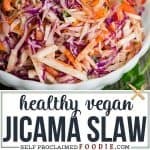 I am a huge jicama fan and I adore this slaw! This was such a delicious salad, the flavors were so bright!